With a high in the 80s today, and abundant sunshine, I felt inspired to get outside this afternoon. 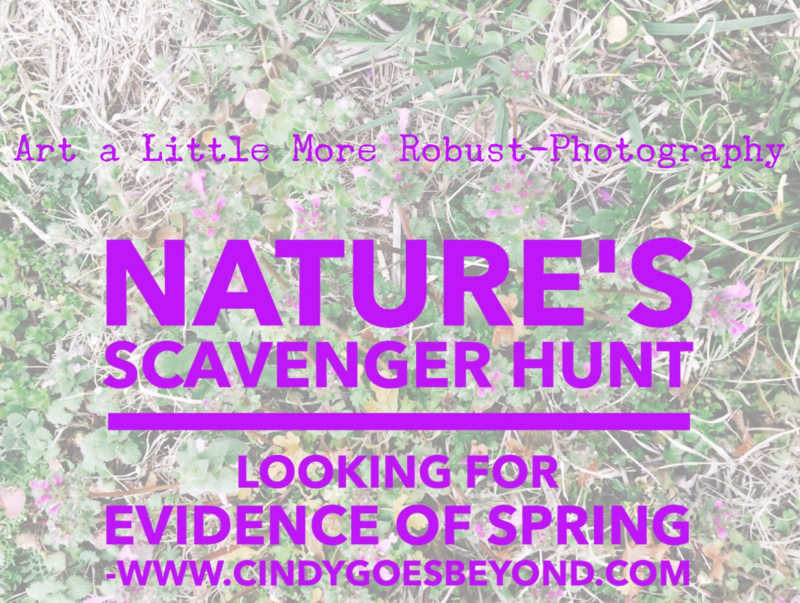 What came to mind was a sort of nature scavenger hunt, a search for evidence that spring is on the way. I envisioned myself walking along the river in Wildcat Park, capturing signs of springs with my iPhone camera. It was an inviting idea that drew my interest. Except it didn’t happen. Work kept me busy today, as I took care of clients and uploaded documents, answered phone calls and met with buyers. Coming home as the sun hung low in the western sky, I considered not accepting the invitation to go on a walking scavenger hunt. It would be too dark by the time I reached the river. Switch to a different adventure, such as using my cooking experience at lunch time today for tonight’s creative blog, even though I had posted that recipe in my health blog. 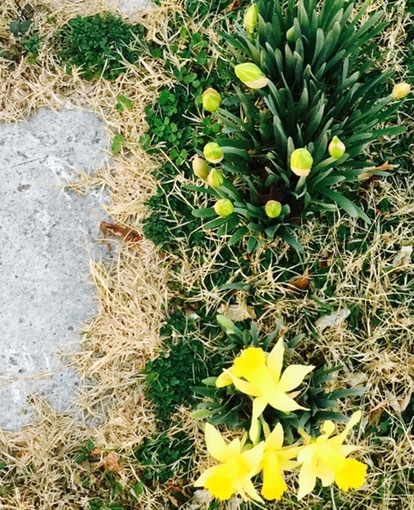 Or…stay closer to home and walk in my neighborhood, collecting photographic evidence of spring. I was physically tired. 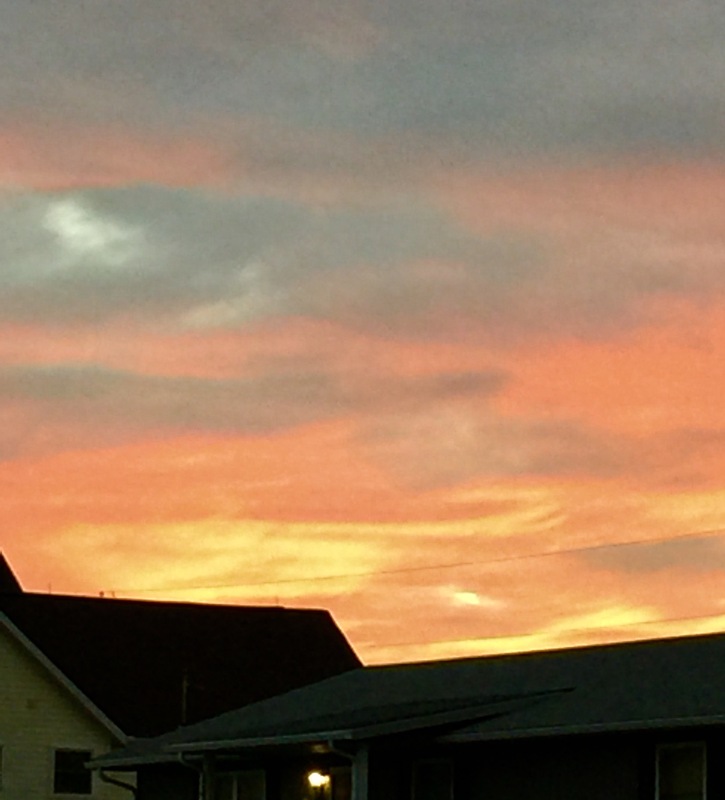 However, standing at the window, enchanted by a spectacular sunset, it didn’t take long to don a lightweight hoodie and grab my phone on the way out the door. It was too beautiful an evening to pass on this invitation. 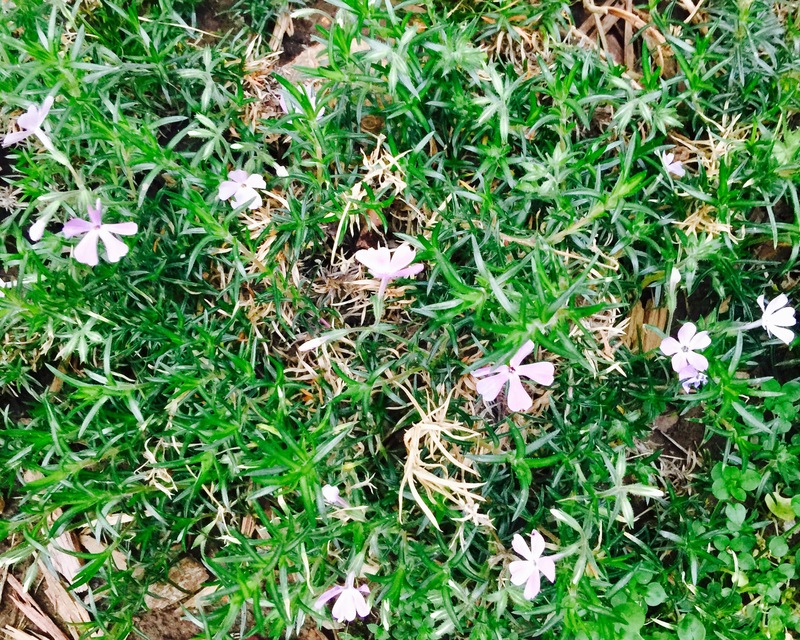 I started my walk in my own backyard, where creeping phlox, transplanted from Leta Moore’s flowerbeds, is thriving and beginning to bloom. Irises are creating spiky fans in the garden as well. 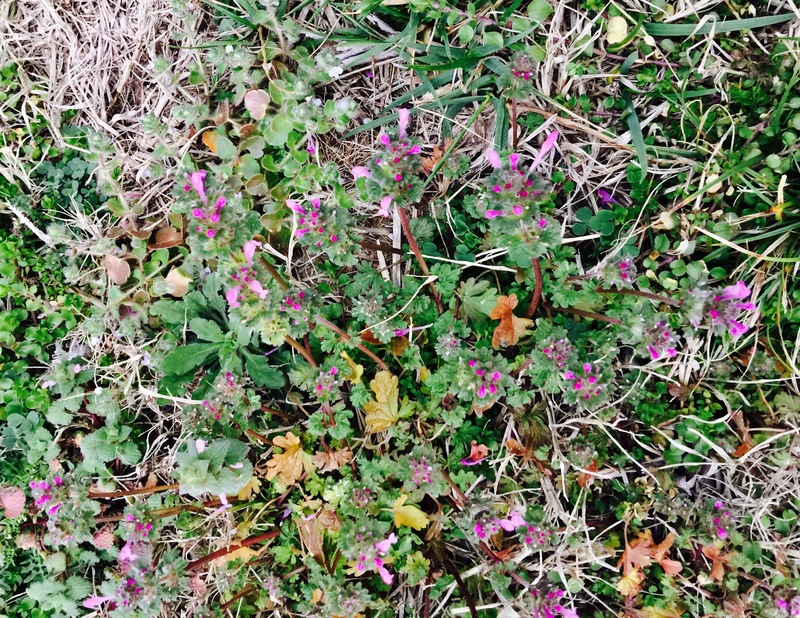 Although this Missouri wildflower is considered by most to be a weed, Henbit is one of the first plants to announce spring’s arrival. 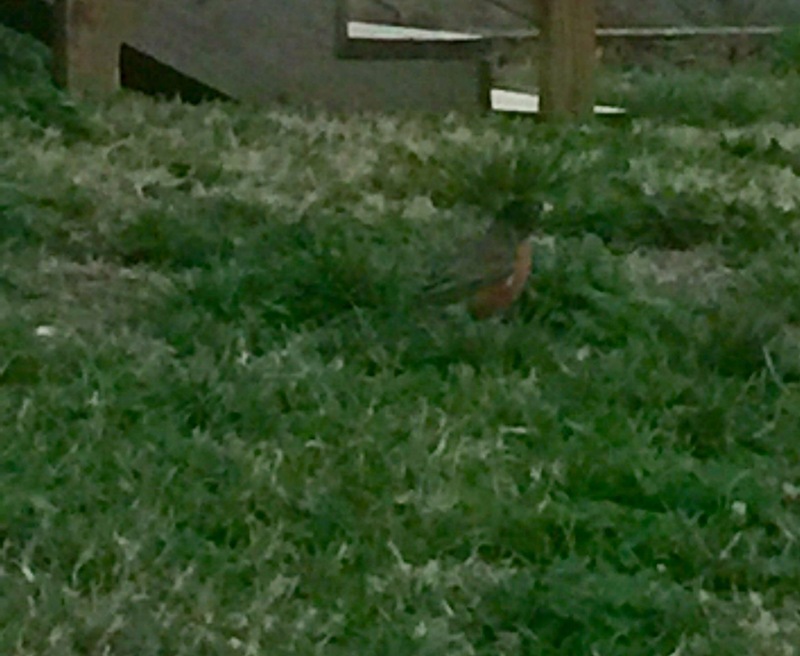 The robin is a sure sign that warmer weather is approaching. These cheerful jonquils not only herald spring, they are a testament to survival. They are the only remaining evidence that a house once stood on a now vacant lot. 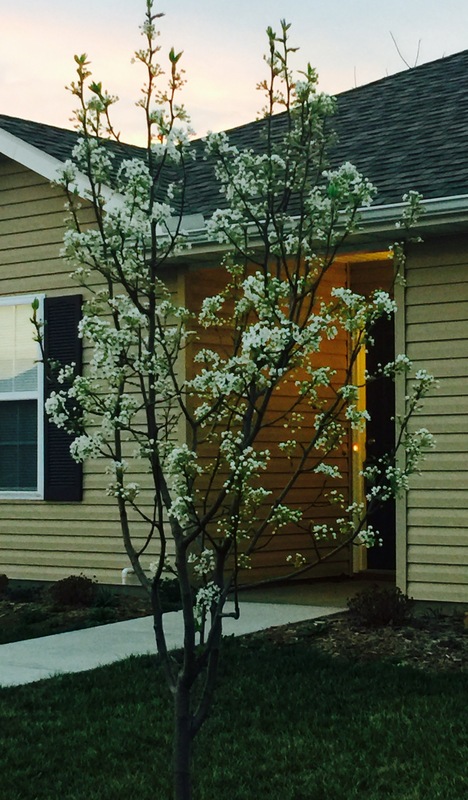 Ornamental trees in bloom, like this pear tree, made me smile. 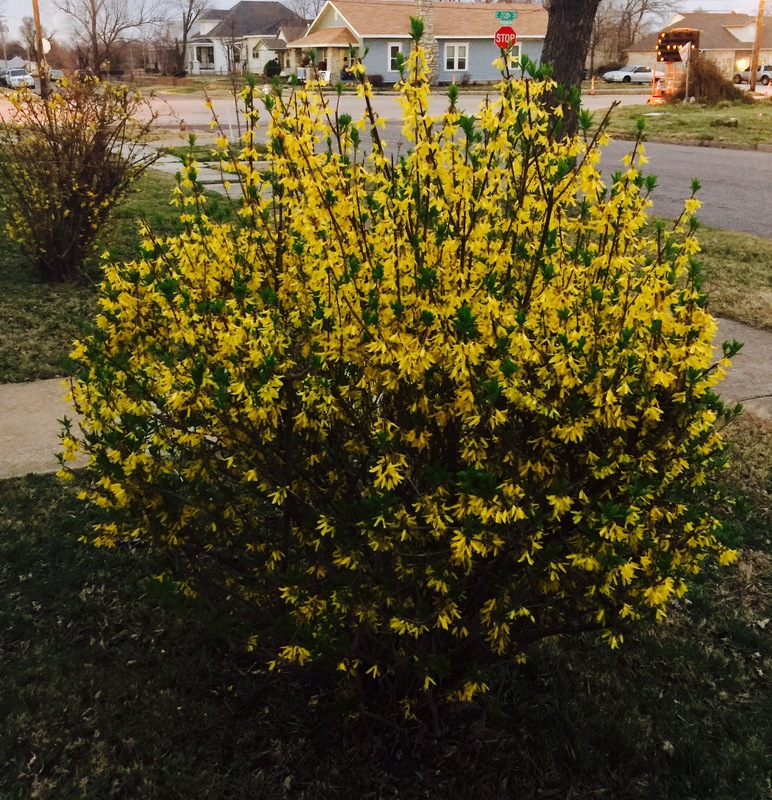 Forsythia bushes are in full, riotous bloom. 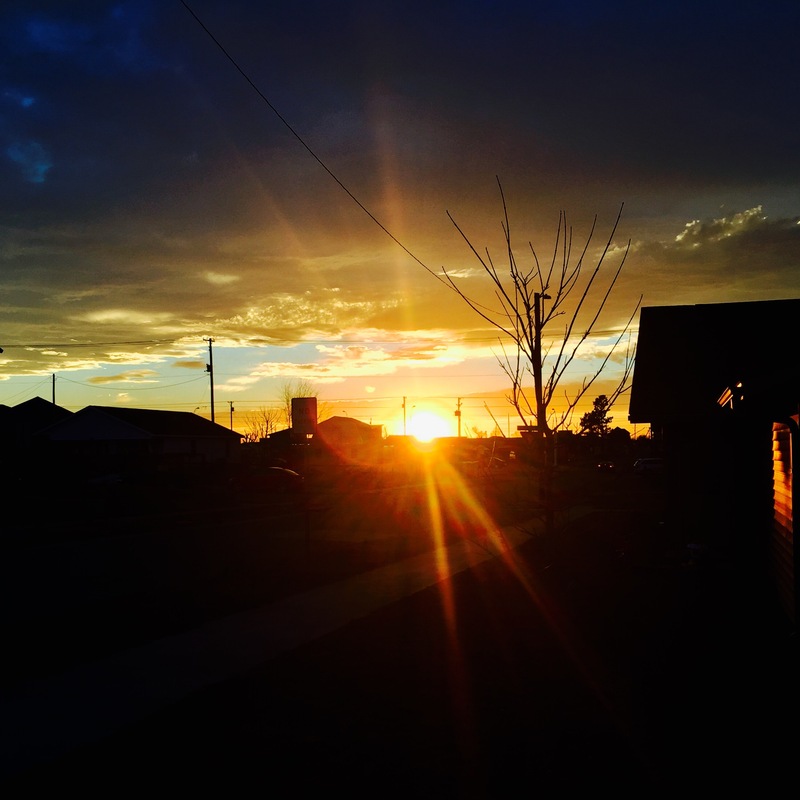 The sky was darkening as I turned toward home. I was so glad I heeded the call to walk this evening. No river gurgled nearby, but concrete streets hinted at journeys and destinations unknown as they disappeared on the horizon. My neighborhood is bereft of mature trees, due to the 2011 tornado. But young trees are growing, thriving, and breaking up the landscape again. Rather than spying deer or squirrels, I caught sight of birds and cats and inquisitive dogs who watched me stroll by from their fenced yards. Mossy boulders were replaced with jagged chunks of concrete, uprooted after the storm, and left clustered in empty lots. Beauty abounded. 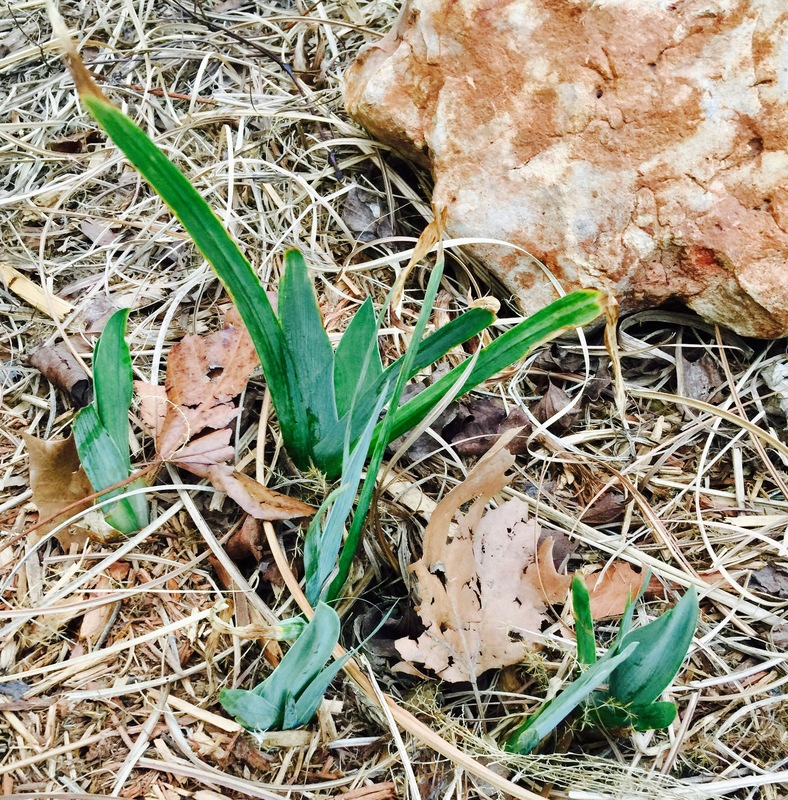 And everywhere I looked, there was evidence that we are going to have an early spring. The temperatures will dip again, surely, but today offered a promise that winter is almost over. I was scanning the block ahead, to see if there was anything of interest to check out, when a brightly colored shrub caught my eye. I was reminded of the story of Moses and the burning bush. 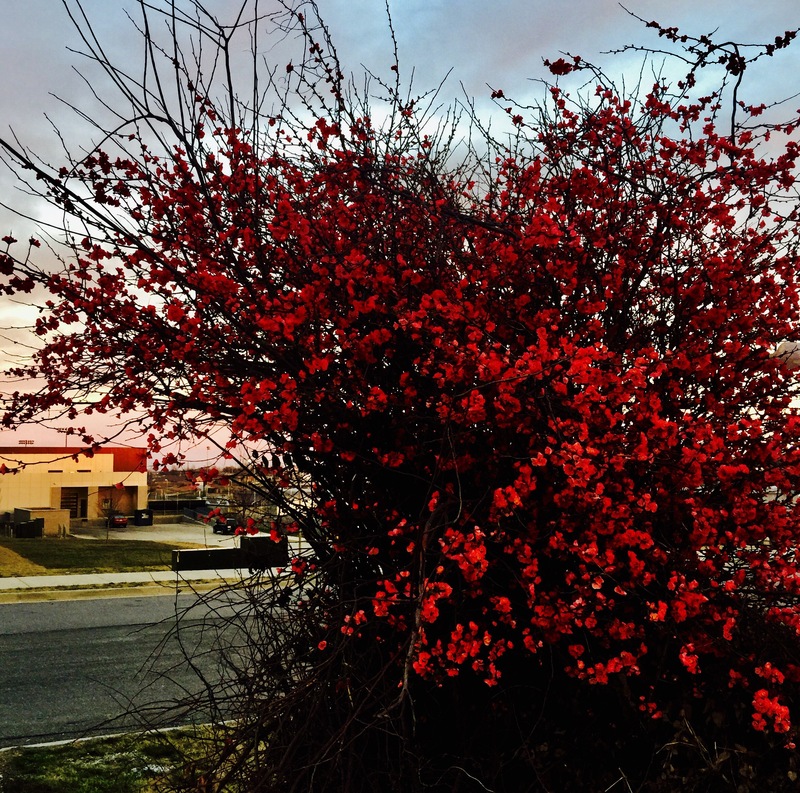 This bush was aflame as well, and like Moses, I had to get closer. 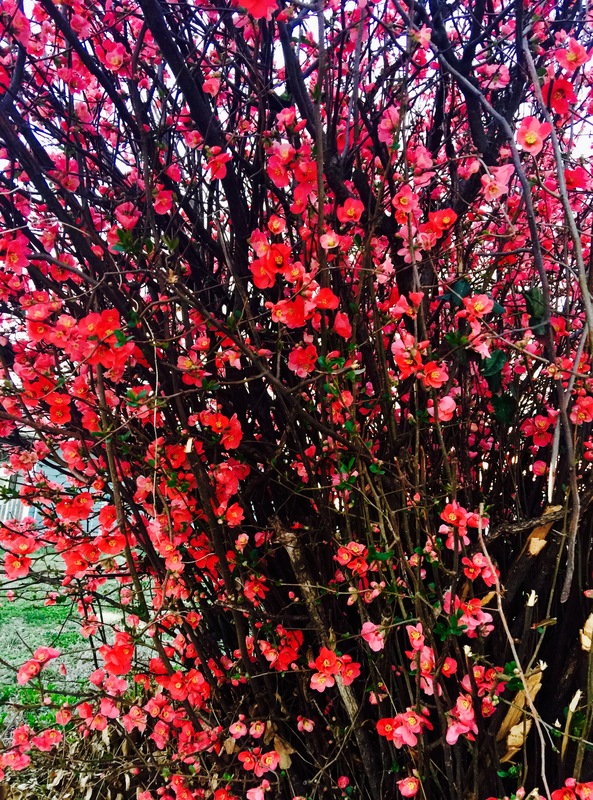 The Japanese Flowering Quince stood alone in the corner of an empty yard. The house is gone. But oh, this shrub, full of coral colored blossoms, towered above me. The artistic child within squealed with delight as I stood beneath the sheltering branches of the quince bush. I was reminded of one of my hiding places as a child, a huge flowering bush that I crawled beneath, whenever I craved solitude. This. This quince was what my soul was looking for this evening…beauty, resilience, a promise. The sun slipped below the horizon as I lingered within the embrace of craggy branches alive with hundreds of blooms. I felt refreshed and full of quiet joy. It was time to go home. I had found what I was looking for. Spring is coming. The earth and I, we are being reborn.